A young boy moves to America from Ghana. He is worried about forgetting his past. Thanks to his mother, he is able to go back to the world he once knew. 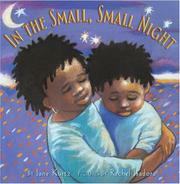 Kurtz, Jane, “In the small, small night,” Children's Picture Book Database at Miami University, accessed April 24, 2019, https://dlp.lib.miamioh.edu/picturebook/items/show/13375.